This cake is simple to make, really refreshing, excellent to make ahead. I have been craving tart cherries like crazy lately. 10 years ago, I have craved dried apricots, and sometime later I got a baby girl... I think now, with snow melting away, I just felt like eating something which reminds me of warmer days! Preheat oven to 360 F. Mix egg whites with sugar, then add flour with baking powder, and walnuts, and combine well. Transfer into a spring form pan (8inch) with base aligned with parchment paper. Bake for about 15-20 minutes. Cool, and transfer onto a cake plate; return the spring form ring around it. Mix whipped cream with vanilla sugar, and powdered sugar, fold in cherries. 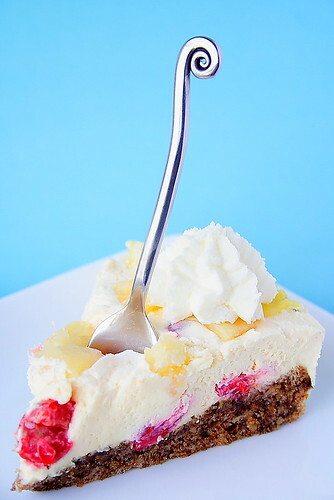 Spread over cake base with spring form ring around it, then top with pineapple chunks. Chill well for few hours in a refrigerator, or about 30 minutes in a freezer. Decorate with whipped cream, and enjoy! Credits: I have adapted this recipe, and adjusted it to my liking from "Kuhinjica"(Little kitchen), a Serbian cooking magazine. Fino i lagano! Probat ću sigurno! Looks delicious and definitely refreshing! Beautiful photos. Oh my!! This looks scrumptious.. This looks delicious - can you describe what whip cream stabliser is like - I've never seen it in the store, but maybe I am looking in the wrong place. JS - whipped cream stabilizer helps whipped cream hold its shape longer. It's available in most grocery stores, follow the link below to check it out. I love it, but I am sure there are other brands. Dr.Oetker brand also has great baking powder, and vanilla sugar in similar packages, and they are usually stacked next to each other in stores, usually in baking needs aisle, or perhaps in International foods aisle. Looks beautiful! I love tart cherries a lot. Here in California they are a rare treat.I find them in ethnic markets mostly. 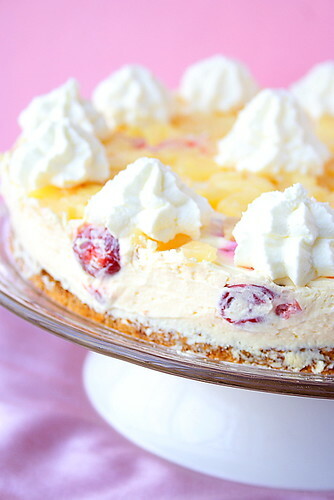 it looks nice and creamy:) i like the combination of fruit and whipping cream. Looks beautiful and delicious! My grandmother would make a torte like this but she would have the fruit in a layer on top of the whipped cream. I really loved the walnuts in the crust when she would make it. I'm Russian, but don't think I've ever had a fruitcake like that. It looks delicious and the photos are gorgeous.